Believe it or not, you can make some pretty attractive items using none other than toilet paper rolls. The crafts that I have found are not the typical kids crafts, making toys or animals. 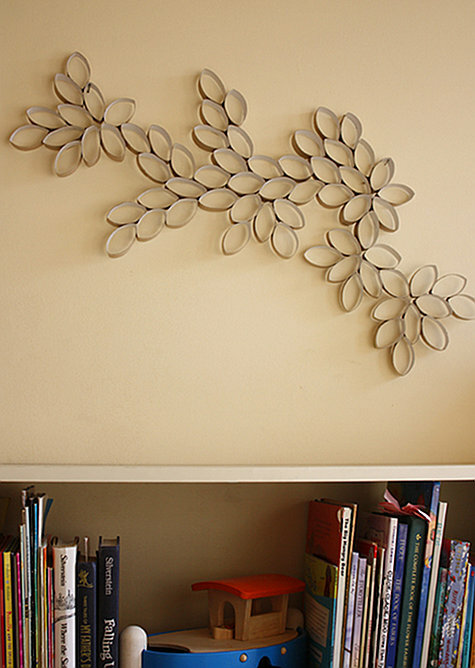 These are actual decorative items that you can craft to use in your home. This first craft is one that I had posted previously. You can find the tutorial for the napkin rings here. In just a few easy steps you can have a set of napkin rings for any occasion. 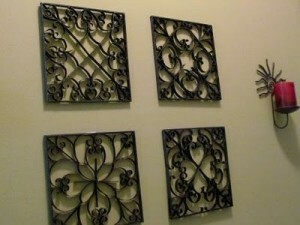 This is also a great inexpensive way to decorate for special occasions. Holiday napkin rings are fun to make with festive fabric scraps or remnants that you can buy. 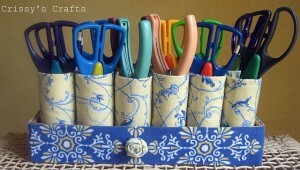 I love this craft storage idea by Crissy’s Crafts. Her fabric choices over the cardboard rolls and box are so pretty. I like this more than a lot of the storage systems that I see for sale in the stores. And, to think it was made from toilet paper rolls! 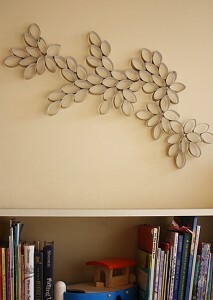 This is a fun idea by Design Sponge for wall art in a kid’s room. The rolls are simply cut, pressed and pinned in an artistic design. I would think that you could also add a little color by painting the rolls first in one or more colors. The flower design painted white on the white canvas looks very sleek and classy. 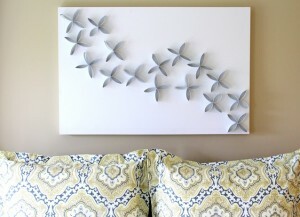 This is another craft project that is super easy to do so make sure to check it out. This design was done bySuzy’s Artsy Craftsy Sitcom and I think it is one of the best toilet paper roll wall art designs that I have seen. There is so much detail put into each square. The metallic paint finish makes the art look just like metal. She did use a combination of paper towel tubes and tp rolls. Check out her tutorial for the full instructions. 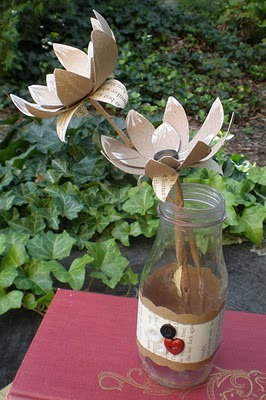 Finally, I just love these flowers made from paper towel tubes. You could easily do the same thing with toilet paper rolls I would think. The flowers may just be a little smaller. This craft idea by Design By Night also incorporates a recycled jar into the design. This would be a fun accent in your shabby chic or rustic decor. 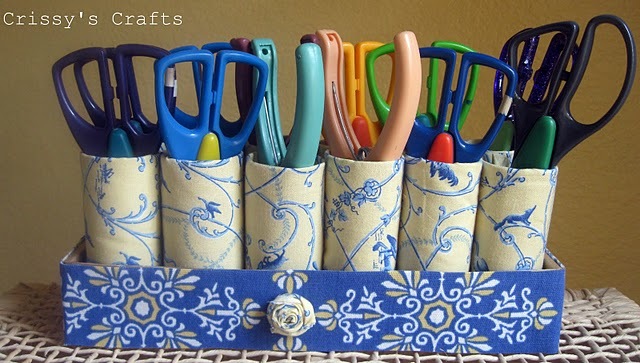 The t/p roll and paper towel roll projects are so incredible. 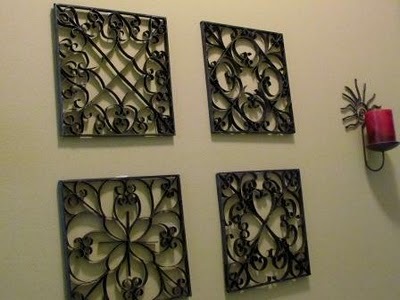 Those faux iron looking squares are so believable looking. Wow what patience and imagination. How much fun to make things with something you would throw out. Doggone it just remembered I pitched a paper towel roll yesterday, why did I do that. Darn. I’ll be spending alot of time on this site, love to find things I can make with what I have on hand as my budget is zilch. To me that’s more fun than being able to go buying alot of supplies.